One last "winter taste" where coats and thighs were involved. I wasn't sure about posting this look since most of you are enjoying Spring blooms already but the love for this Lie Sang Bong floral dress was strong enough so I decided to share with you. Absolutely amazing and unique dress!! Love these mix of blue shades! That coat is so pretty! Those shoes are so sweet! 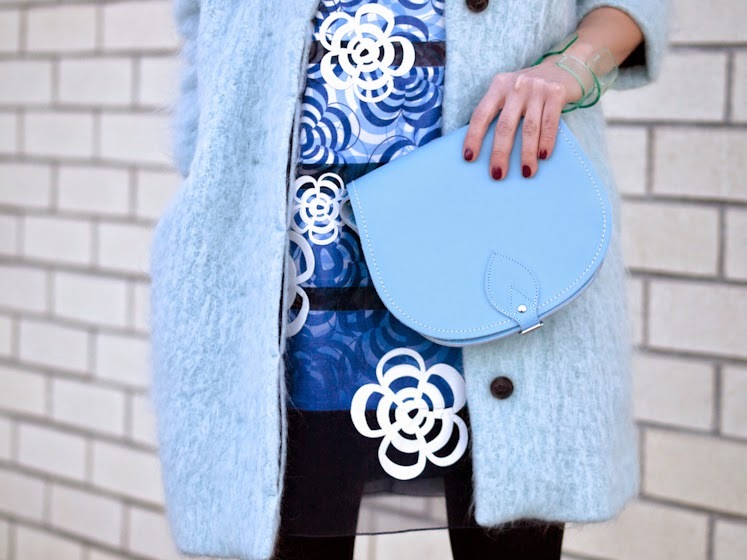 I love the colour and the coat is to die for… no more winter blues now! baby blueee!! I love your coat… but, in this time I don’t think that I can buy it! It’s such an oroginal, beautiful dress VERONICA! And I’m definitely in love with that fluffy candy-like coat! The dress looks amazing, lovely outfit! I’m secretly in love with all your vintage coats; I wouldn’t have said this one is H&M. Super cute! Cool look! I love the way you layered the dress and top, it’s super unique! As far as I’m concerned, you can keep posting “wintery” looks for a while. I live in Wisconsin and it’s in the high 30s, low 40s. And won’t be much warmer for some time. Blue is my favorite color, so this look is fabulous. The dress’s print is very eye catching and pulls the whole look together. Very nice. So much texture and variation going on here. I adore this look and am also hoping that winter will be over soon! your colour ways always inspire me! <3 love the all blue outfit. You look lovely! I like your coat.